I’ve talked before about how kids love mail, and there is nothing truer. In fact, my kids know when their subscription boxes have shipped. They love tracking their packages all the way to our front door! They’re especially excited about a new book box for kids just like them who love to read: Tiny Humans Read. Tiny Humans Read is a new book box for kids—a monthly subscription box for kids—sending new books to kids from birth to age 8. The big launch is on February 1, but you can join the VIP mailing early and get 10% off your subscription for life when orders open. 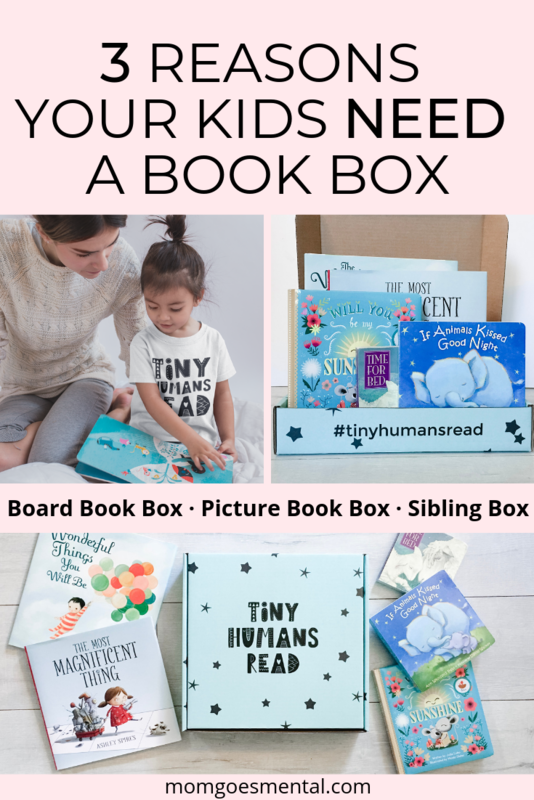 I’m loving Tiny Humans Read for so many reasons, but there are some really exciting reasons you need to get this book box for kids, too! Every box includes multiple books, too, so even families with multiple kids in each age group will be good to go… without having to buy multiple subscriptions. School reading logs are the bane of my weeknight routine. I really hate to force my kids to read when they aren’t feeling it (and I frequently don’t). Tiny Humans Read sends a curated selection of new books right to my door, meaning there is always something new to dive into with the kids. I love the idea of not having to pack up all my little ducklings to get to the book store. What’s more, the element of surprise means they’ll be excited about reading and the log will just become a piece of paper to fill in. Parenting win right there! Free shipping is amazing! I would hands-down rather know exactly what I’m going to pay before I hit the checkout screen than get there and see a separate charge for shipping. I blame the expectations given to me by Amazon Prime. Whatever the reason, though, affordability and free shipping are top priorities for this family on a budget. All of the book boxes from Tiny Humans Read are totally affordable and ship free—yes, momma! With prices ranging from $17.99-$29.99 and the value of books exceeding that in every subscription, I’m completely sold. And did I mention free shipping is amazing?! So, how can you get in on this now? Tiny Humans Read just launched and is offering 10% off for life to anyone who subscribes in February. Learn more at tinyhumansread.com or go follow on Facebook and Instagram. This awesome. I wish they had this box when my girls were younger. If you find a book subscription box for 11 and up I would love to hear about it. My grandchildren LOVE to read! This would make such a wonderful gift. I have had a subscription book box for my granddaughters for a few years now! They love getting the books each month. I’ve not heard of subscription boxes for kids before. What an awesome idea to get kids reading! It really is! I love that kids can get a box just for them and then have an engaging and educational activity. Parenting win! How fun is this!! I’ll have to look into it for my girls, they LOVE to read!! Oh I love these books. Perfect for our 5 years old. Lately she seems to be more interested in a lot of books. Thank you for sharing. I have actually been researching book subscription boxes for my kids!! This looks very cool. Definitely! We love book subscriptions—though really the kids love anything that comes just for them. My daughter loves reading . This book looks something exciting. Will subscribe for if. I have really considered getting this for my girls! They love books! And I love they come to you in the mail and it’s fun for them to open! That’s totally the best part! They know what that box looks like and can get excited about what surprises are inside.